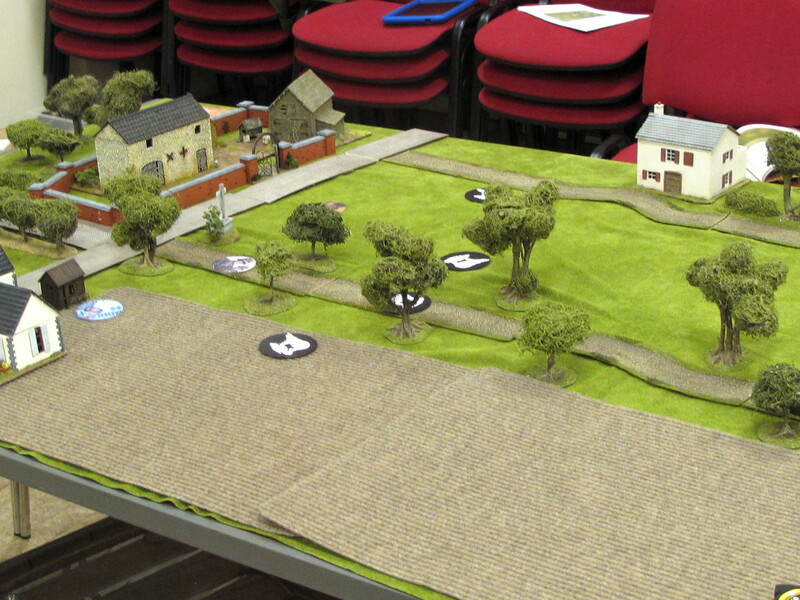 This is the first game of our latest Normandy campaign, Operation Martlet. The British 49th (West Riding) Infantry Division are tasked with pushing back the Germans back from the Rauray spur in order to protect the flank of a major attack scheduled for the following day. This first game has both sides badly affected in their deployment. On the British side units can get lost in the mist, and only successfully deploy on a 4+, with the Germans even more disrupted by the 250-gun barrage they’ve just endured, and deploying on a 5+. 25th June 1944, near Caen in Normandy. The young SS platoon leader coughed and pushed the dirt off him where half his foxhole had caved in. His signaller was sitting at the other end of the pit yelling into the field telephone. At least he looked like he was yelling, but the Oberscharfuhrer couldn’t hear a thing. That had been the worst artillery barrage yet. “Get me company”, he yelled but the soldier signalled no can do, and to prove the point yanked the wire of the field telephone until the frayed end of the wire fell into the trench. “Run another one”, the NCO yelled, and the man eagerly grabbed a roll and started running it back towards the rear. Above them Nebelwerfer rockets streaked through the sky towards the Allied lines, their mournful wail sounding faint and distant to his battered ears. Some of the buildings around him looked like a giant had been kicking sand castles at the beach. But the stone barn that formed the strongpoint at the centre of his platoon’s position was standing. Good, they’d need it when the Tommies arrived. That would be very soon. Both sides are fresh into action, although pre-campaign fighting has left the Germans down to 7-man squads. That’s more than made up for by the presence of a Panzer IV attached to the platoon. The tank scrape for their Panzer IV. The countryside around Caen is gently rolling farmland, this may be Normandy by it’s not bocage country, most of that is to the west in the American sector. The northern (British) end of the table is open ground and fields with low crops that offer no cover. The German outposts are located along the paved road. They are dug in and have prepped buildings for defence but have no obstacles like wire or mines. No problem though, as they have plenty of machineguns and supporting armour to dominate the killing grounds to their front. The map from the campaign book, showing the start positions of patrol markers. View from the British end. Not much cover there. I rolled well for free moves in the patrol phase, and jumped all four markers 12″ up the table. The Germans were easily able to get their markers beyond the line of buildings that offered the most obvious line of resistance, and once I’d got the British markers beyond the house on the western table edge I deliberately locked all my markers in the centre to prevent the Germans gaining any more ground. The house and hedge at the western table edge offer the only cover that the British can put a JOP into, so the rest will go on their table edge, making their patrol phase objectives pretty focussed: get as far up on the right as possible, then stop. Marker positions at the end of the patrol phase. Those cheap and cheerful doormats representing fields in the foreground will get tarted up for later games. British JOPs in blue, Germans in red. Both sides rolled up Force Morale 9 for the battle, a healthy amount. So far the campaign effects are yet to kick in and nobody has any bonuses or penalties. The game is a “Probe”, to win the British have to get a unit off the German end of the table. The one thing the British really need in this scenario is for their troops to show up, so my first support pick was an extra section in case some of mine wandered off into the mists. The layout of the map and the mission objective meant that I might have to assault at least one building, so I’d need all the bayonets I could get. You may have already noticed the lack of tanks in the British support and thought: “What are you doing? Where is the AVRE?”. The ground in this game is pretty open, and I assumed that the Germans would have a Panzer IV in a hull down position. So it hits you on a 5+ (72% chance), and you hit it on a 9+ (17% chance). I don’t fancy those odds. I didn’t want to blow all my support on tanks and send them into a fight where the odds were stacked that badly against them. So the plan instead was to bring two 2″ light mortars, and blind the immobile German tank or force it to move. The AVRE is awesome at knocking down buildings, but only when it’s not a burning wreck sitting next to the entry point. The infantry would have to clear the Germans out of their defences the old-fashioned way. The 3″ mortar battery can (when it works) neutralise a lot of defenders and allow me to gang up on the rest. The jeep is there because it’s cheap and potentially a game-winner in a Probe scenario (ok, that’s a bit of a long shot, but you never know). Basically the plan was to smoke and mortar the defenders enough to allow whatever rifle sections turned up to find a hole and squeeze through. One weakness in this plan is that the Senior Leaders would have their work cut out coordinating all that support, meaning the Corporals would have to handle their sections without much help. Plus I didn’t know exactly what would actually turn up on board, although I did have spares of almost everything I needed. The German plan? The central barn was reinforced to bunker status, giving the MG teams there the ability to dominate the open ground. 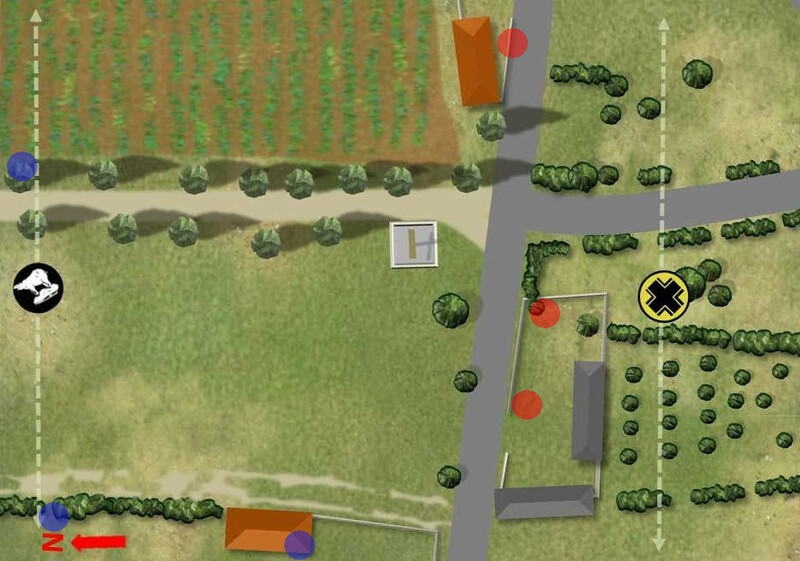 The Germans were expecting British armour, so the plan was to site their tank in the southeast corner of the table behind a farmhouse, effectively an ambush position for anything advancing down the dirt road. The game plan was pretty simple: set up fields of fire and cut the Tommies down as they came over the open fields. Luck shined on the British in the first phase, with two full sections and a senior leader turning up on table, enough to get an attack rolling right away. They deployed into the house and along the hedge to its rear, and a Bren in the house started putting covering fire on some likely German deployment points. They needn’t have bothered though, as the Germans managed to deploy absolutely nothing in their phase because of the barrage. The next British phase was a double one and seeing the lack of Germans opposing him the British platoon commander decided to try his luck and called forward his spare PIAT team in a jeep. Meanwhile, the Lieutenant hopped the hedge with one of his rifle sections and ran across the fields in a short dash, before ordering the men to ground and having them pepper pot forward in echelon. The Bren in the upstairs window continued to stitch steady controlled bursts into the gateway of the farm compound, while another section piled out of the same house (by deploying from the JOP there), broke out into line abreast and started covering the open ground tactically. The SS officer came storming up to the rear of his barn strongpoint. The young NCO sprung out of the trenches where his men were sheltering. “If you don’t get those guns into the upstairs windows now you’ll have something lodged in you first”, said the Oberscharfuhrer, kicking him in the pants. Two sections cross the open ground in front of the Germans. That pile of sacks behind the wall is actually a German JOP. The German’s were faced with a target-rich environment: two rifle sections in the open, and a softskin booting it along the road. The senior leader managed to deploy himself and a squad, trusting the adjutant to bring up the rest. They set up two MG42s in the upstairs of the fortified barn and opened up on the advancing Tommies, hitting one man straight away and suppressing the rest. The Bren reacted by switching its covering fire to the windows where the muzzle flashes of the MG42 were seen, and helped by another double phase the corporal of the lead section got his men up and charged them towards the small barn about 30 yards away. Miraculously they made it intact. They’d picked up a decent amount of shock, but only lost one man crossing the open ground. German fire now switched to the other section left in the middle of the field with the British platoon commander, but the covering fire and tactical stance of the British limited the impact to some shock. Meanwhile the cheeky jeep continued its suicide charge bold thrust down the road, and raced over the junction onto paved road, only one more activation from victory. The British CO tried to call up some support for it, but both the fourth rifle section and the 2″ mortars were delayed, lost in the fog. Alas, there’s a reason the army doesn’t use jeeps to lead assaults on enemy positions. At the end of their last phase the Germans had played a CoC dice to end the turn and now all deployment restrictions were lifted for them. Their Panzer IV rumbled onto the table blocking the road in front of the jeep. The German tank opened up with both MGs at about 30m range, but some amazing swerving from the jeep driver saw no serious hits (only 1 point of shock!). Right about now I was starting to get excited about the idea of the jeep blasting past the tank on the next British phase, with both crewmen giving the panzer two fingers on the way. I also though about debussing and giving it some from the PIAT, but my daydreams were cruelly cut short when Phil brought on another panzergrenadier squad and plonked them in the hedge about 5″ away from the jeep and cut the two crew to ribbons with machine guns and SMGs. For an encore the Germans brought on another squad and opened fire on the British section still in the open. The infantry join the jeep shooting party. The British situation had gone from generally good to moderately bad with the arrival of so many Germans. They had one section well forward into the line of buildings, but they had to hold up and rally shock before resuming their advance. Another section was in the open and while they hadn’t taken any casualties their shock had built up to the point where they’d be unable to advance much in tactical stance.One Bren gun was covering them from above, but there were now five MG42s able to concentrate fire on them which was firepower the British gun couldn’t hope to match. Calls for the 2″ mortars to come up with smoke and the FOO for the medium mortars to lay on a stonk were to no avail, they were somewhere in the mist. That section was going to get absolutely battered if they stayed where they were, and the Germans had set up a crossfire that would mean they had no cover even if they reached the walls of the farmyard to their front. On top of this a German tank was about to appear around the corner and the platoon only had a single PIAT at the extreme end of its range to answer it with. So with the eyes on the objective the plucky corporal of the leading section mustered his still somewhat disorganised group behind the small wooden barn and charged them deeper into the German position. Helped by (yet another) double phase they made it off the table edge and snatched a victory for the attackers before the defences could do any more harm to their mates caught in the open. The German Oberscharfuhrer watched over the shoulder of his machine gunner as they peppered the British unit in the open. He was pretty sure some of the Tommies had got into the buildings nearby, but they’d disappeared. The field phone rattled and he picked it up. Damnit, thought the German leader. His platoon was in a good position, fighting fit and they’d caught a load of British in a trap and were going to wipe them out. So how had the British triumphed? Inspired generalship? Well, not really. I’d rolled well for early deployment and managed to get a good amount of troops on, while the Germans (always the best-dressed army in WW2) were obviously trying to be fashionably late. I then got no fewer than three double phases in quite a short game, which kept my guys moving. For once the combo of covering fire and tactical movement paid off, and kept the sections crossing the open ground from getting too badly hit. The double phases meant they could dash at 3d6 for a phase, then be back on tactical in time for the next German phase, which helps. British casualties had been 3 men, the two-man PIAT team in the jeep and one rifleman from the leading section. The PIAT team had been a support pick, so this only counted one casualty against the platoon and the chart said that he was off getting patched up next game. On the German side: zilch. No casualties at all. I think I only shot at Phil’s troops about three times and only inflicted shock. I’d used plenty of covering fire but had concentrated on movement while the Germans were hamstrung by their deployment restrictions and we hadn’t settled into any protracted firefights. The German CO was not impressed at the speed with which the British had slipped through the German line and docked a point of opinion, but at -1 overall this wouldn’t affect the Germans in the next game. The men of the Hitlerjugend were also proving difficult to impress, and neither their own light casualties nor those they inflicted on the British caused any increase in their opinion. The German platoon commander moves from “Happy” to “Content” for the next game. On the Allied side the CO was pleased, boosting his opinion to +1. The men however were unhappy about taking casualties without dishing much out in return and penalised their leader 1 point (clearly the stupid brave lads in the jeep had been popular). None of this seemed to get through to the Lieutenant, who shifted gear from “Secure” to “Sociable” mood, giving a handy +1 on next game’s Force Morale roll. An easy one for the Germans: exactly the same platoon as last time. The British have one rifleman in the hospital. Wheeled vehicles are always, always a good pick in Probe games. My cheeky 1 point jeep caused Phil to put his Panzer IV on the road instead of in its tank scrape, and also sucked a squad into deploying against it. The British artillery barrage is evil, and will severely cramp German deployment, but as soon as that first turn ends everything will appear on the table. Don’t get caught in the open with your pants around your ankles when all those MG42s turn up. This scenario for the Brits is all about pushing as hard as you can early on. You can make a lot of ground before the Germans recover from the barrage, and in a Probe game covering ground is all that counts. Don’t “stay and play”. Leg it over those open fields and get off the table edge ASAP. It’s all about focussing on the objective…and rolling incredibly jammy dice, John! Yes I’ll second that ,a excellent write up, love your detail, especially the interactive pictures showing deployment and movement of the troops, nice reproduction of map on the gaming table and a good game,thanks Andy. Great read Andy – I do favour the old jeep myself as well in games requiring a speedy exit through enemy lines. Great post. Great post! I learn so much from your reports–keep them coming! Hi, just about to start this campaign as Brits so all intelligence is welcome. Did you post AARs for the following matches, I can’t seems to find them? Did you finish your campaign and, if so, how did it turn out? Yes, we played through the whole campaign. You can find the rest of the games by going up the “Content Explorer” in the top menu and clicking on the Operation Martlet link, or by clicking on the “martlet-campaign” tag in the tag list at the end of this article.